The apartment(only for non-smokers!) adjoining a detached villa with private pool is located in a very sunny, subtropical and secluded garden on a hill partially covered with pine trees in an area with very little traffic. The town and the beaches can be reached in 15-20 min walking, the next supermarket/ restaurant is only 400 m away. The apartment has 1 bedroom for 2 people, 1 bathroom and a living room with American kitchen. The various terraces with sun-beds and furniture, the pool and the big barbecue can be used whenever required. 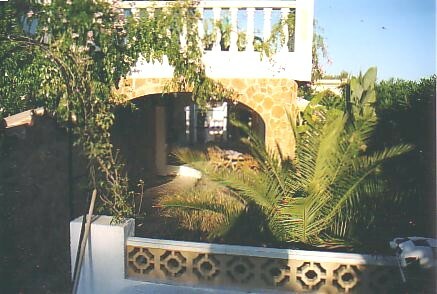 The access to the apartment and the terraces is all on one level. Extra wide doors give easy access for partially disabled people. The apartment is furnished in a cosy Spanish style. central heating with hot water, Sat-TV, radio with CD-player, washing machine, refrigerator, coffee-machine, microwave, kettle, toaster, ventilators, flat-iron etc. All windows are double glazed, have mosquito nets, roll shutters and window-grates for security. Important: In case that the apartment is already booked in your preferred period, we may have a similar apartment with the same standards available. For further Information either look on our webpage or contact us.